Speaking in House of Lords debate, Justin Welby says law will undermine marriage as basis for rearing children. 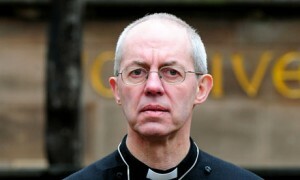 The archbishop of Canterbury has torn into the government’s gay marriage bill, warning that it will create “different and unequal” forms of marriage that will undermine family life. As peers embarked on a two-day debate, in which 91 are due to speak, Justin Welby claimed on Monday that the bill was in an “awkward shape” and would undermine marriage as the basis for rearing children. The archbishop made clear he shared Dear’s concerns about the bill. Welby told peers the bill had created confusion, adding: “Marriage is abolished, redefined and recreated – being different and unequal for different categories. The new marriage of the bill is an awkward shape with same gender and different gender categories scrunched into it – neither fitting well. Dear told peers that the exchange between Alice and Humpty Dumpty could apply to the gay marriage bill. “My lords, I would suggest that if we substitute the word ‘marriage’ for ‘glory’ we get somewhere very close to the essence of this debate today. As Humpty Dumpty might have said: there is a nice knockdown argument for you. Marriage means just what I choose it to mean: neither more nor less.